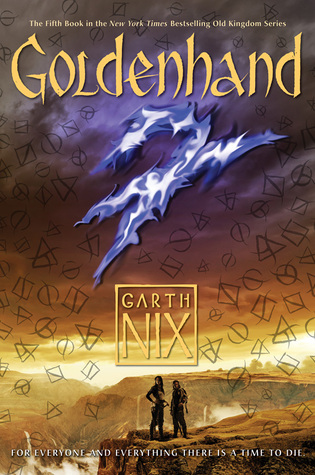 Goldenhand is a welcome return to Garth Nix’s Old Kingdom universe, but it unfortunately feels, overall, a bit half-baked. It’s an enjoyable read if one doesn’t think too hard about it, but the truth is that Goldenhand is problematic in numerous ways that detract from the joy of revisiting such a well-loved fantasy world. Goldenhand is a direct continuation of Lirael’s story following the events of Abhorsen and picking up about a year or so later. It also incorporates events from the novella The Creature in the Case, which continued the story of Nicholas Sayre after he returns to Ancelstierre at the end of Abhorsen. Lirael has been hard at work learning in her role as Abhorsen-in-waiting to her sister, Sabriel, and she’s given the chance to take on more responsibility when Sabriel and Touchstone go on their first vacation in twenty years. Meanwhile, after accidentally freeing and empowering a dangerous free magic creature, Nick is on his way back towards the Old Kingdom in pursuit of it. Meanwhile, Chlorr is still stirring up trouble in the north, and it turns out there’s a whole previously unmentioned group of people that are being used for Chlorr’s nefarious ends. There’s a lot going on, at least ostensibly. Perhaps the biggest problem with Goldenhand is that, despite the ambitious worldbuilding and great number of things happening, none of it particularly works. It was interesting at first to be introduced to Ferin and her people, but with only Ferin as a point of view for that part of the world and no sense of what normal life is like for the tribes, there’s ultimately very little to learn about these new people and their culture. Ferin herself has a very specific and non-normative experience within that culture—she was raised to be basically a sacrifice, sequestered from the rest of the tribe and denied even the humanity of a proper name (“Ferin” is from a childish mispronunciation of “Offering”)—and she’s the only one of her people the reader meets directly. The rest are faceless villains and obstacles for our heroes to overcome, and there’s no real sense of who these people are and how they normally fit into the regular fabric of the Old Kingdom. This diminishes the reader’s investment in Ferin’s history and struggle, and it’s not helped along by Ferin’s extremely practical nature. She’s so pragmatic about everything that happens to her that it ends up feeling as if she isn’t affected very much by anything she goes through. This would be frustrating in a minor character, but Ferin is a point of view character for fully half of this book, and it’s extremely difficult to become really immersed in a perspective that is so poorly socialized and without enough context for understanding why and how she’s the way she is. Ferin is a weird character, and not in a good way. Rather, she takes up a lot of page space without ever being compelling enough to be a proper balance or complement to Lirael, who we already know from previous books. Sadly, Lirael, too, is a lot less interesting this time around. Lirael and Abhorsen were heavily focused on Lirael’s journey to discovering her own identity and finding her place in the world, and there was a clear and well-executed character arc as she came of age. Goldenhand gives us a Lirael who is much more confident and self-assured to start with, which isn’t necessarily a bad thing, but this Lirael doesn’t have nearly so much to learn or so far to travel, for all that she goes fully from one end of the Kingdom to the other. Some attention is paid both to Lirael’s lost hand and her grief over her missing friend, the Disreputable Dog, but neither of these things are given the weight they ought to have. Indeed, Prince Sameth has already built a magical gold hand for Lirael by the start of the book, which effectively erases her disability. Most of Lirael’s thoughts about her hand are marveling at how functional the magical prosthetic is rather than lamenting the loss of the real hand. Similarly, Lirael does at times miss the Dog, but with everything else going on there’s not much time for truly exploring her feelings of sadness and loss. Instead, Lirael’s primary arc in this book is a romantic one, mostly centered around her growing feelings for Nick and her relationship with him. While Lirael’s final dealing with Chlorr/Clariel seems intended to be a climax for the story, it happens quickly and the novel is then ended rather abruptly, which prevents the event from having much emotional weight. This lack of impact is, frankly, characteristic of Goldenhand. Erasing Lirael’s disability and glossing over her grieving process in favor of focusing on her burgeoning relationship with a man she barely knows (and who doesn’t get much development of his own, by the way) makes for a very slight novel. Both that romance and Lirael’s quest to stop Chlorr once and for all rely far too much on previous books in the series to generate what interest they do hold. If you haven’t read Lirael, Abhorsen, and Clariel (and preferably The Creature in the Case as well), you’re likely to find yourself more than a little at sea in Goldenhand. Goldenhand is not an entry point into the Old Kingdom for new readers; it’s a book for superfans who will consume anything they can get in this setting without being too picky about things making sense. This overall effect might have been counteracted if Ferin’s story was stronger, but Ferin’s goals and purpose are never quite clear; she is trying to do something to save her people I guess, but most of her chapters are taken up by an aimless chase that never manages to feel dangerous or high stakes enough to justify its existence. Instead of acting as a powerful new addition to the series, Ferin’s story functions mostly as a rather dull and uninspired distraction in what might otherwise have been a decent piece of fan service. While Garth Nix does a lot of work here to expand the world of the Old Kingdom and provide more theoretically fertile ground for, presumably, future sequels, Goldenhand is plagued with enough craft problems and various missteps that it’s hard to get very excited to learn what comes next. Unless it involves queer Ellimere (I mean, come on—everyone else has been paired off heterosexually now) and lots of Mogget (there was not nearly enough Mogget in this book), I can’t say I’m very interested. After many re-reads, I decided that what cripples the narrative is the fact that we don’t actually go into the north itself. If we had, Ferin’s story would have had a greater context, and we’d be able to feel something for the northern armies that have to go into battle against their will. Chlorr’s resolution would have had much greater depth. And why is there so little Chlorr in this book anyhow, when she’s the principal antagonist? I wish that Nix had just let this be Ferin’s and Chlorr’s book. Because in between that, there’s the fanservice yeah, but it’s not good. I’ll take the half cooked ideas from Ferin’s part of the story and think about how good this book could have been.